Gorgeous 19th century Papier Mache Face Screen Pair feature a Chinoiserie design, with tiny mother of pearl inlay pieces in the scene, divine! 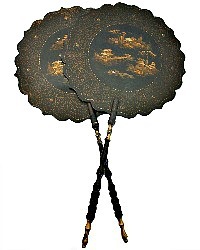 A pair is rare to find, these decorative face screens or fans are beautiful. 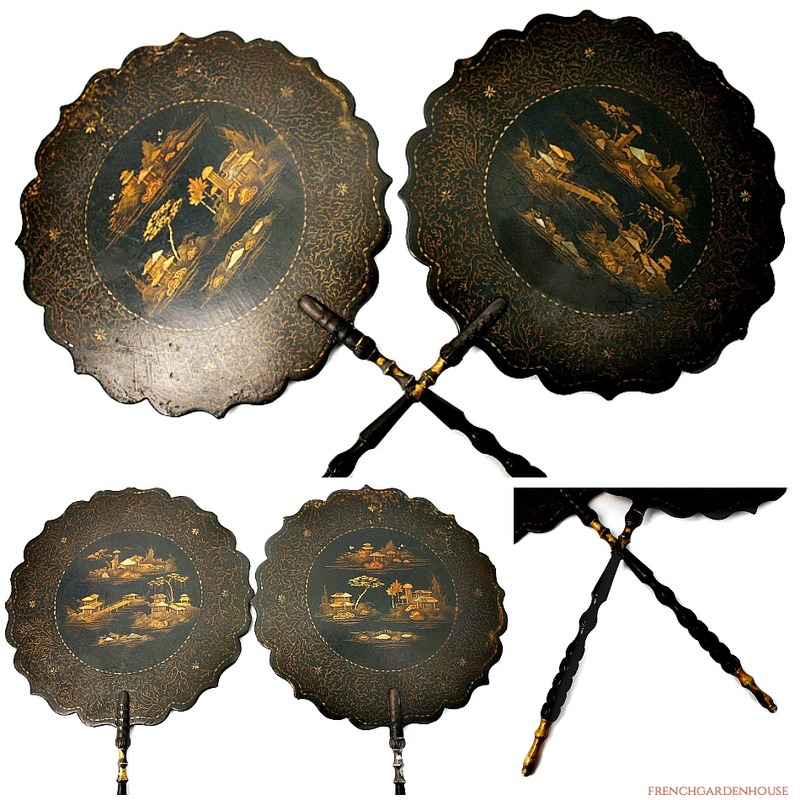 Works of art, painted with gilt, hand turned handles, and scalloped rims. Designed to allow a lady to sit close to the fire, without the threat of red splotches appearing on her face from heat. Makeup was wax based, so these fans or screens also protected ladies from having their make-up melt. Stunning framed, or display them on your mantel or a fireside table, these screens add superb decorative quality to your Country French, English Manor, Traditional, and even Contemporary decor. 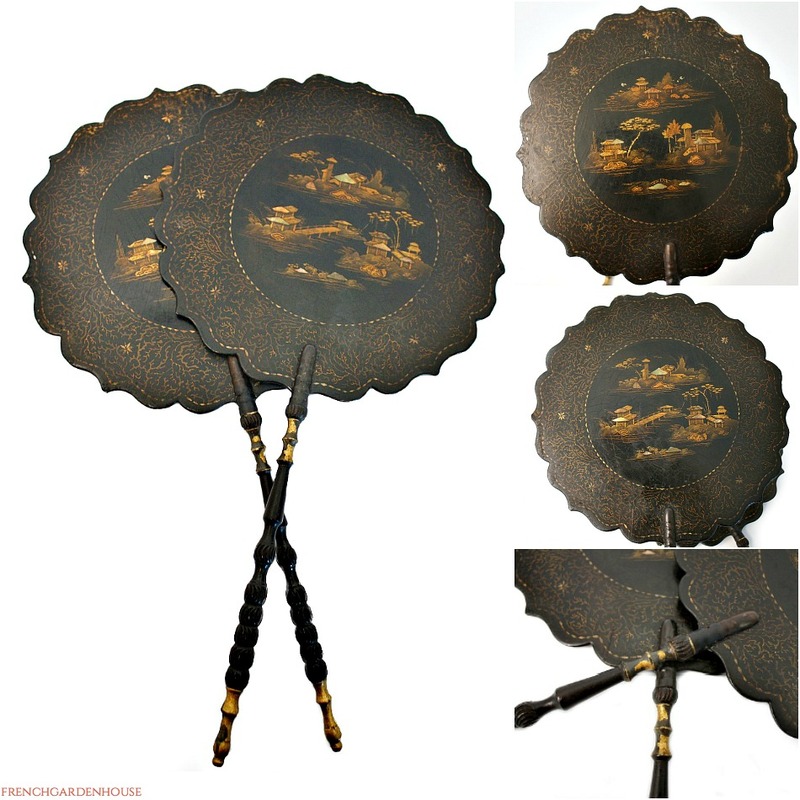 Beautiful to add to your collection, these are in good condition with craquelure you would expect, and a portion of the gilt painting that has worn away over the century. The edge was repaired long ago with gilt paint to mask that some of the miniscule inlay mop pieces have run away over the last hundred or so years. Measure: 17" long x 8~3/4" in diameter.